Select the Packages tab and then the Dim. 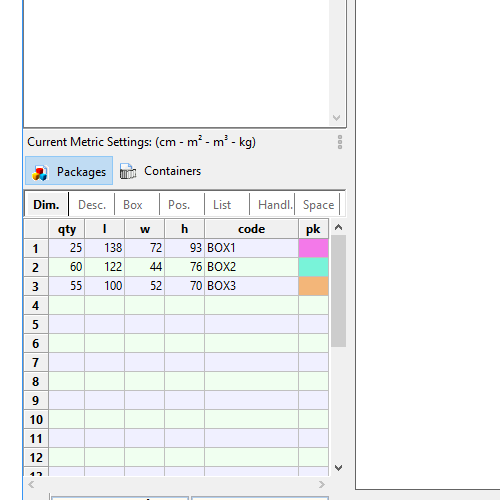 grid, which lists quantities and dimensions of the packages. 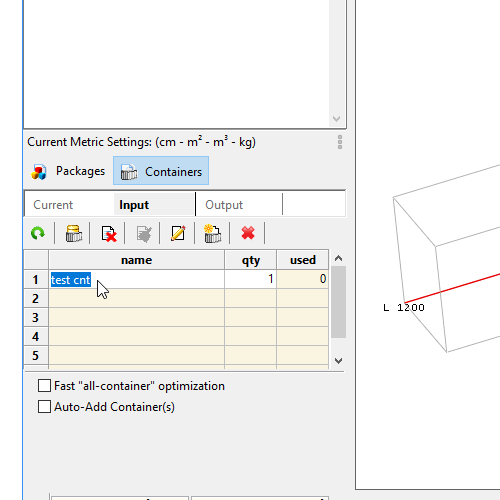 Enter number and dimensions of the packages in the cells of the qty (quantity), l (length), w (width), and h (height) columns. Although not necessary, assign a unique label to each row (code column). This will come in handy later. Dimensions are whole numbers and the default units are centimeters. 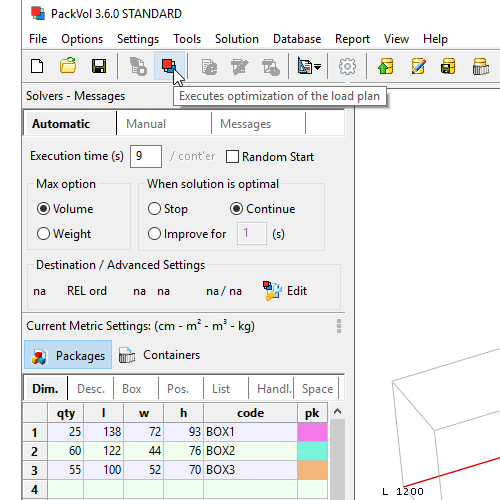 In Tutorial 2 we will see how to set Metric units and why packVol uses numbers without decimal separator when defining sizes. Select the Container tab and then the Current panel. 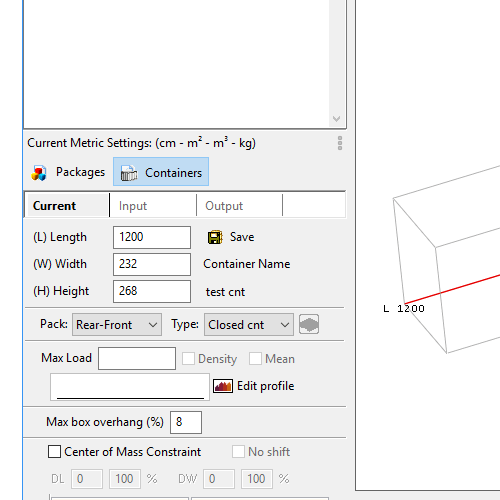 Enter the inner dimensions of the container in the Length, Width, and Height edit boxes. Leave the default values for all other parameters. Make sure the values are as shown. The dimensions of the container are whole numbers and must conform to the package units. As soon as the container is defined, it's immediately displayed on screen. Select the Container tab, and then the Input panel. Although not necessary, enter a name for the container by editing the name cell of the container grid. This will come in handy later. Make sure that the Fast "all-container" optimization and the Auto-Add Container(s) check boxes are cleared. Select the Automatic panel and enter a running time not too high, for example 9 s. Leave all other parameters unaltered. To start the optimization, use the Tools → Start Evaluation menu command (shortcut key Ctrl+R), or press the tool. We've completed the first optimization! The result is shown on screen and the view can be changed — for example by holding down the left mouse button and dragging it. Save your work using the File → Save menu command (shortcut key Ctrl+S), or press the tool. The file format has extension 3dp. As an example we choose the name Tutorial1.3dp.